Dr. Tammy Ferguson is originally from Mississippi and is an accomplished educator with more than 20 years of experience working within a multitude of educational environments. She has been a principal/director, area director, assistant principal, curriculum and learning support specialist, professional development coordinator, and business education teacher in K-12 and higher education settings. She attended the University of Southern Mississippi and graduated in 1995 with a Bachelor's degree in Business and Technology Education. In 2001, Dr. Ferguson graduated from Nova Southeastern University with a Master's degree in Educational Leadership. In 2004, she graduated from Nova Southeastern University in Fort Lauderdale, Florida with an Ed.D. in Educational Leadership. She has extensive educational experience and knowledge in working with students and families from racially diverse populations, diverse cultural and language backgrounds, various income levels, and various levels of academic achievement. She has comprehensive knowledge of the current federal, state, and local mandates and initiatives throughout K-12 and higher education. As an Area Director of School Accountability in the School District of Palm Beach County (SDPBC), Dr. Ferguson was responsible for the supervision, management, and oversight of 29 elementary, middle, and high schools in the 13th largest school district in the United States and the 4th largest school district in the state of Florida. For six years, Dr. Ferguson served as the Principal at the Village Academy School on the Art and Sara Jo Kobacker campus, which is the only public, non-charter K-12 school in the Palm Beach County School District with over 700 students enrolled in elementary, middle, and high school on one school campus. During her time at Village Academy, she was instrumental in growing the school from a K-4 school to a comprehensive K-12 school. Also during her tenure as a principal, she collaborated with the District's Early Childhood Department to implement a Pre-K program for children birth to 5 years of age. 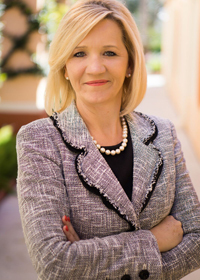 In her current administrative role in the Florida Atlantic University Lab School District, Dr. Ferguson serves as both the director and principal and has administrative responsibility to oversee and manage academic and curricular implementation, facilities, finances, programs, recruitment, admissions, accreditation, and policies and procedures for the A.D. Henderson School and the FAU High School. The A.D. Henderson University School is an elementary-middle university laboratory school on the FAU campus with an enrollment of 600 students in kindergarten through 8th grade. FAU High School is a dual enrollment school located on the FAU Boca Raton campus with an enrollment of 500 students in 9th - 12th grade. FAU High School is a highly selective dual enrollment program for advanced and gifted students who have the opportunity to complete high school graduation, earn university college credit hours, and graduate college by the time they graduate high school. Under her leadership, Dr. Ferguson has achieved significant academic achievement gains and recognition. On the 2015 Reading/Language Arts Florida Standards Assessment (FSA), the FAU School District was ranked the #1 school district in the State of Florida in reading proficiency. Additionally, she facilitated the leadership that resulted in the FAU School District ranked #1 out of more than 3,000 schools in the State of Florida in reading pledge achievement on the 2015 Summer Literacy Adventure sponsored by Florida's Governor First Lady and the Florida Department of Education. She has provided effective, on-site school leadership that has resulted in the FAU School District being named the top ranked DRS in the State of Florida. One of the most innovative aspects of her current role as Principal/Director is managing and developing the undergraduate research opportunities for FAU High School students. Over the last four years, she has been instrumental in facilitating more than a 500% increase in student enrollment at FAUHS. The vision of Dr. Ferguson was to enhance and launch relevant research for FAU High School students to formalize the pipeline for motivated students to get involved in research within their discipline of choice. The Research Program has exposed students to research and scholarly inquiry in a variety of disciplines, especially those in the STEM fields, in order to ignite their personal curiosity. It consists of a multi-course program that guides and supports students through learning basic, widely-used research skills, helping them find a faculty mentor at FAU, and facilitating their research experience with that mentor. After developing and honing their own research interests, students are given the tools to follow their curiosity through the research process step-by step. This includes introducing the students to research being conducted at FAU and other research institutes like Max Planck Florida Institute in Jupiter, Florida, developing a research project proposal, finding research funding, data analysis, and presenting and publishing research results. This program enables exceptional students to refine their career paths, develop research skills, and stand out among not only their high school peers, but also other undergraduate students when applying for future opportunities. The program consists of four college level courses where students are exposed to a variety of research while building their research skills and working one-on-one with a faculty mentor. FAU High students involved in this program take advantage of integrated opportunities available through FAU's Office of Undergraduate Research and Inquiry, such as the research workshops, the Undergraduate Research Grant, and the Undergraduate Research Symposium. Furthermore in her role as Principal/Director of FAU High school, Dr. Ferguson facilitates the innovative opportunity for students to begin the path to college and career readiness years before their peers. Under her leadership, students are provided the opportunity to achieve excellence through advanced coursework at the college level and early introduction into their field of study. These highly motivated students impact research discovery in fields like engineering, medicine, and technology for years to come. This partnership encourages access and success in degree programs in the STEM and Health fields. Dr. Ferguson has participated and been extensively involved in various educational initiatives as a regional and national education leader. In 2005, she was selected to attend the prestigious Harvard University Principals' Center to receive specific principal leadership professional development from education experts from around the country with fellow principals. This opportunity was very key in her career development and provided essential management and administrative skills that she successfully utilizes in her role as a Principal/Director. Dr. Ferguson also worked closely with the Boston Consulting Group to create a proposal for the Bill & Melinda Gates Foundation for Empowering Effective Teachers. She also served on the School District of Palm Beach County Superintendent's Graduation Task Force for Black males to research and develop interventions for increased academic achievement. In 2015, Dr. Ferguson conducted a national presentation on the benefits of a successful laboratory school-university partnership and how the partnership helps prepare the next generation of highly effective educators. Dr. Ferguson also presented to the Florida House of Representatives Choice and Innovation Subcommittee in 2015 on the impact of Florida Developmental Research Schools. In 2006, Dr. Ferguson was recognized by the Palm Beach County Teachers Union for her positive school leadership and management of teachers and received the Top Five Principal award. In 2007, Dr. Ferguson was recognized by the Palm Beach County Literacy Coalition for her accomplishments in facilitating literacy achievement for children and received the Presidential Award for Outstanding Literacy Support. Dr. Ferguson is a current member of the Board of Directors for the Delray Students First non-profit organization. The mission of Delray Students First is to assist and provide resources and opportunities that help economically disadvantaged students in the Delray Beach, Florida community reach their potential through homework assistance and tutoring, cross age mentoring opportunities, college preparation assistance, and experiential social activities.